WASHINGTON (Reuters) - A new round of talks between the United States and China to resolve their trade war will take place in Washington on Tuesday, with follow-up sessions at a higher level later in the week, the White House said. 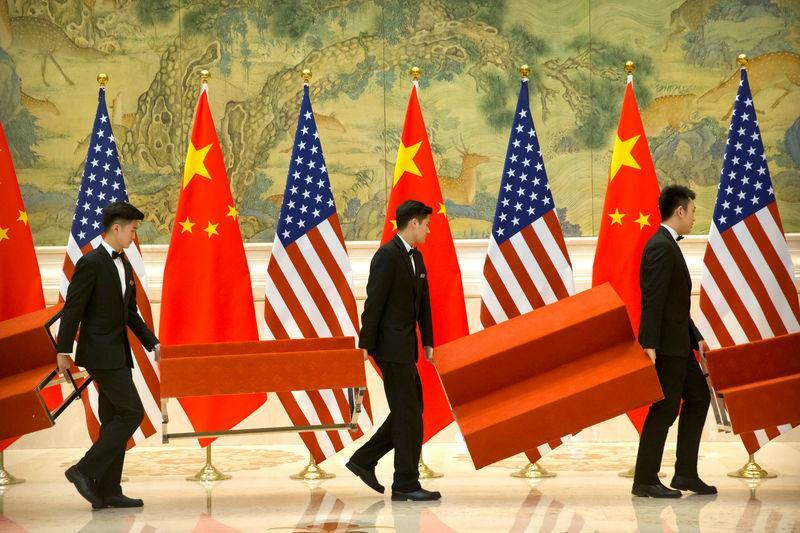 The talks follow a round of negotiations that ended in Beijing last week without a deal but which officials said had generated progress on contentious issues between the world's two largest economies. The talks are aimed at "achieving needed structural changes in China that affect trade between the United States and China. The two sides will also discuss China's pledge to purchase a substantial amount of goods and services from the United States," the White House said in a statement. The higher-level talks will start on Thursday and be led by U.S. Trade Representative Robert Lighthizer, a strong proponent of pressing China to end practices that the United States says include forced technology transfers from U.S. companies and intellectual property theft. China, which denies that it engages in such practices, confirmed that Vice Premier Liu He will visit Washington on Thursday and Friday for the talks. The White House said Treasury Secretary Steven Mnuchin, Commerce Secretary Wilbur Ross, economic adviser Larry Kudlow and trade adviser Peter Navarro would also take part in the talks. U.S. tariffs on $200 billion (£155 billion) in imports from China are set to rise to 25 percent from 10 percent if no deal is reached by March 1. Trump, who suggested last week that he could extend the deadline for the talks, reiterated in a speech on Monday that the negotiations had been fruitful. "We're making a lot of progress. Nobody expected this was going to be happening," he told a crowd in Florida. Speaking in Beijing on Tuesday, the Chinese government's top diplomat, State Councillor Wang Yi, told a visiting U.S. business delegation that everyone was "paying attention" to the talks. "If our two countries can respect each other and cooperate it will not only be the right choice for us but it is also the common hope of international society," Wang told the group, which included U.S. Chamber of Commerce Executive Vice President Myron Brilliant and former U.S. deputy secretary of the treasury Robert Kimmitt. Brilliant said that in the last year or so there had been "serious discussions about economic issues". "We are hopeful that the two sides will reach a comprehensive, bold and significant trade agreement that will be enduring and long-lasting. This is the challenge for both governments."